A phrase that came to mind was one Manjusvara once used of his friend, Vajradaka – ‘a magician’. There was something of magic about Manjusvara, so let me say that first. After he died we had a practice evening at the Bristol Buddhist Centre and in the silence between readings of his poems, a blackbird sang. More than one of us came away feeling he’d been there with us. If you’d like a few more concrete facts, he had Irish roots, was born into a working class family in Hertfordshire in 1953 and through all his early-into-middle life, music was his passion. At three, he was frustrated with the toy piano he was given, and went on to study music (including with John Cage), becoming a composer. Sometime in all of this (in his late 20s) he very nearly died in a car accident in America. This changed his life. Soon after (I think) he went to the London Buddhist Centre, helped build it (wearing gloves to protect his pianist’s hands!) and decided to ask for ordination. He talked of working at Aryaloka, the Triratna Centre in New Hampshire, making wooden hearts for a right-livelihood business. His great love was Meg, the American woman who became his wife (though they later divorced, but remained friends). They married, Meg said, particularly to make it easier to travel to India together on a trip for the Karuna Trust in 1990. There was a long and painful story around them getting married, as this happened in the midst of the time when marriage ‘wasn’t done’ in the Triratna Community, and the effects of how they were treated at the time reverberated through the rest of his life, I think it’s fair to say – and think he would say. His relationship with the Dharma, the Buddha’s teachings, and his writing was interwoven. He’d often say ‘I’m not a Buddhist’, meaning by that, that he rejected formalizations and ‘isms’ – not that he rejected the Buddha. The Dharma is in the DNA of his writing – so integral, perhaps, that an inexperienced eye might miss it there! There are times when he more explicitly mentions the Buddha and the Dharma. His poem Ghazal, Buddha reads like a sutra, to me, and his detective novel (The Deal Runner, also being posthumously published this summer) has Dharmic themes and references woven through it. surely this is reason enough to smile trust in our goal, let things happen as they should. One can’t talk about Manjusvara without mentioning India and the Karuna Trust – two other great loves of his life. He and Meg honeymooned (as he put it) in India, meeting Dhardo Rimpoche – the last Triratna folk to see Bhante’s teacher alive. The connection with Dhardo Rimpoche was immensely important to him and he often spoke of him, and of this trip. Manjusvara’s feeling for the Dalit community (who were labelled ‘untouchables’) was immense. For 20 years or more he was good friends with Aniruddha, an Order Member who grew up in ‘the hell of caste’ and he had many, many other friends in India too. Out of that love grew his work with the Karuna Trust – fundraising to help improve people’s situation there. He loved his Karuna work best of all and said, rather poignantly, that as he grew older and needed to give things up, he’d want that to be the ‘last to go’. He described fundraising as a spiritual practice as being like ‘a magician’s hinge’. I’ve no idea what that literally means – but it captures his fascination with it beautifully. I think he was pointing to the mysterious potential to transform that comes from putting all of oneself into communication with other people in the service of ‘something more’. In the case of Karuna Appeals, this meant knocking on people’s doors to ask for money out of compassion – ‘karuna’ – for people in India. And crucial to this, he’d always stress, is being absolutely ordinarily oneself, using awareness and kindness to connect on the most human of human levels. Somewhere in this mix is the tension and the grit essential to the realization of wisdom, without which compassion is something mundane. Perhaps that is the ‘magician’s hinge’? Manjusvara used ‘wolf-style’ writing workshops as a tool to help train Karuna fundraisers. Manjusvara died suddenly from a brain haemorrhage in June 2011 in the middle of a Wolf at the Door retreat at Dhanakosa in Scotland. This year marks the second anniversary of his death. 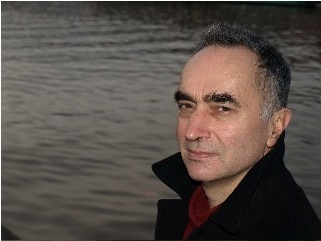 His poetry collection, Lost and Found, and novel, The Deal Runner, have been published to coincide with what would have been his 60th birthday, on 26 June 2013. They are available to purchase online from www.lulu.com/gb.